Grace: One of my favorite words. Grace has such a vast array of meanings to people. To some grace is involved in the gift of salvation. To others, it is a way of being, how one moves or interacts with others. Grace is often viewed as the prayer offered before a meal. As I meditated on the word ‘grace’, I was drawn to the experiential. What would the experience of grace look like in my life? Thus I began a month long practice of noticing grace in my everyday world. The month passed with a greater awareness of the presence of Grace in my life. One day I was driving home down one of the back roads of Pennsylvania that I love to take. Suddenly I took in a whiff of freshly mowed grass. Immediately, I slowed down and looked for the source of the scent. The hay fields were still intact and there were no homes in the vicinity. Not finding what it was that I sought, my attention went forward to the road I was driving on. I was surrounded by woods, a drive I’ve taken hundreds of times before. But this time I was looking with fresh eyes. The woods were beautiful. Welcoming. Stunning. A sense of tranquility, peace, and newness came over me. I needed to remember to breathe. At that moment I had an encounter with the One who created beauty. It was a moment of grace. Once during the month, a discussion with friends turned to a particular Spiritual Practice. As a Spiritual Director, Spiritual Practices are close to my heart. I gave my spiel on the purposes of this practice and some ideas on how to incorporate this into our lives. One person began to object to some of the things I was saying. Later, I realized it was a simple moment of misunderstanding, but at the time the conversation was becoming tense. I sensed an invisible hand on my shoulder and a feeling of “stop talking” come over me. There is a time to talk and a time to keep silent. This realization was not from me, but an action of grace. My husband wanted to take a Saturday and just do something other than yard work. I wanted to start working on a water feature in our yard. Something we both wanted to do, but now that he works from home he really needed some time away from the house. We decide to visit a nearby historical site that we had always wanted to see, but never took the time. My husband had a chance to relax and learn about William Penn. I learned about flax. Really, I didn’t know how linen came from flax. This was a gift of grace to me. Using my over-abundant cucumbers to make pickles gave me great joy and a sense of accomplishment. Walking with a friend and finding that we were like-minded on a controversial subject. Unaware of the severity of the approaching storm, I was not hit by lightning while cutting the grass. These are not huge events, but they were moments of grace I wouldn’t necessarily have recognized if I had not been intentional in looking for grace in my daily life. 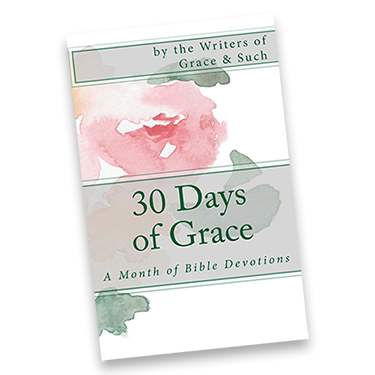 This practice of identifying grace in the course of a day brought me to a practical understanding of how involved God is in my life. His presence is everywhere and all I have to do is open my eyes and see. Even in the tough things of life, He is there. If you would like to try this practice, all you need is a notebook. Plan to review your day and see where Grace has made Itself known to you. Sometimes you will recognize Grace immediately. Other times, you may need to look back and realize, and say yes, that really was Grace. But do write it down, it is such a delight to go over your notes and see where Grace has appeared. Enjoy the journey with Grace. Thank for the reminder to be on the look-out for these moments of grace. Life is so loud & fast at times. It’s important to listen for that still, small voice. Great post. Sometimes God happens at the oddest times, but if we are attentive to Him, we’ll see Him. Me, too, Jen. Me, too. Love to wrap myself in the perspective that grace is all around me, I just have to notice. Will start looking with new eyes and ears….thanks, Beck! Thank you Becky! The practice of identifying grace- yes! It’s like a foretaste of heaven. I needed this today (and every day). I am so glad you put your thoughts down and shared them. I am so grateful to have benefitted from your awareness of everyday grace! Thank you friend, for eyes that see the hand of God. I know that you also see God in the everyday places of your life! I’ve learned from you! This reminds me of the song by Lauren Daigle, “how can it be”. You always write in such a way that makes my eyes widen. Thanks for sharing your gift. I’ve not heard her song before. I’ll listen to it. Everyday Grace — love that! I also loved sharing in your reflections of the gifts that God brought to you. Thank you for allowing me to join in your praise.